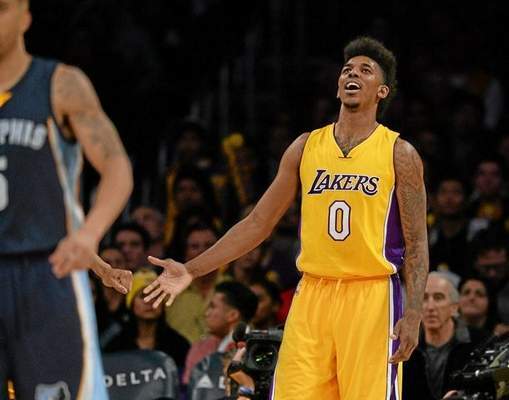 Even after the Lakers signed shooting guard Lou Williams to a three-year, $21 million deal, Kupchak maintained he viewed Young as a significant part of the rotation. It is possible Young will come off the bench at small forward, while Williams will play as a reserve shooting guard. Young naturally has attracted plenty of attention on his off-court exploits, including his recent engagement to hip hop artist Iggy Azalea and attending New York Fashion Week. But once his swollen left knee healed in early May, Young reported training privately near the Valley, telling Los Angeles News Group he has listened to Scott’s advice on spending his offseason to improve his decision making, playing off-the-ball and off-ball defense. Young has also appeared in a pair of Drew League games this summer. Still, it remains to be seen to what degree how the partnership between Scott and Young will evolve, for better or for worse.